A custom content management system for a daily news web portal was needed and Just Web Services was contracted to develop the website. NEWS EXPRESS is Nigeria’s leading online newspaper. 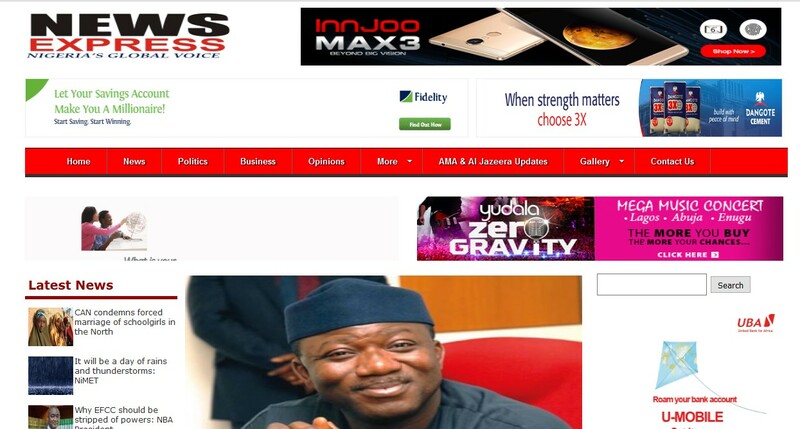 Published by Africa’s international award-winning journalist, Mr. Isaac Umunna, NEWS EXPRESS is Nigeria’s first truly professional online daily newspaper. It is published from Lagos, Nigeria’s economic and media hub, and has a provision for occasional special print editions. Thanks to our vast network of sources and dedicated team of professional journalists and contributors spread across Nigeria and overseas, NEWS EXPRESS has become synonymous with newsbreaks and exclusive stories from around the world. We are blazing a trail in proactive, 21st century reportage of events without fear or favour, telling all stories as they break for the purposes of enlightening our readers and helping them to make sense of events as they unfold at a frenetic pace. Our pay-off line The new voice of Nigeria accurately reflects the role we have assigned to ourselves, which is to serve as the voice of all Nigerians irrespective of their status, ethnic, religious or cultural affiliations. Besides, we shall speak up in defence of Nigeria whenever the opportunity presents itself. Just Web Services successfully developed and deployed the custom content management system for the client.